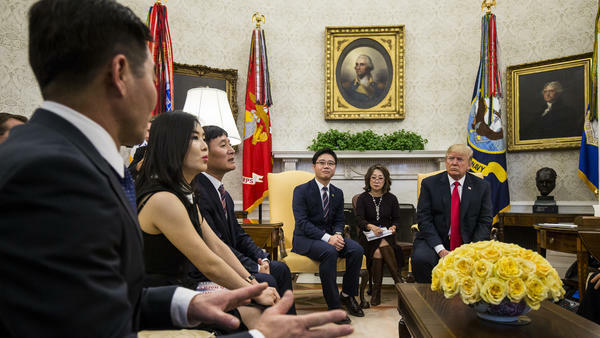 U.S. President Donald Trump meets with Hyeonseo Lee (far left) and other North Korean defectors in the Oval Office of the White House on Feb. 2, 2018. Hyeonseo Lee, author of The Girl With Seven Names, secretly fled North Korea at age 17. Lee spent a decade in China, hiding and living under assumed names, before crossing into South Korea. She says she's both surprised and skeptical about the summit between South and North Korea. "[It] seems like many people in Korea right now at this moment have some sort of delusion about this meeting," she says. "Like 'Oh, we're going to have unification and then going to have big changes.' "
This North Korea is not the regime made for, I think, America or either South Korea — it's made for [Kim Jong Un], to keep his regime, his power, to protect himself from even domestic political situations. I helped my family cross the border seven years ago from North Korea, and we all [have] found freedom right now. But my mom, she's right now 60-something, and I really hope it happens in her lifetime, because she lost her close seven brothers and sisters, and she's the one who's really crying every night. It's really hurting for me to see her. And then, I can give her everything, but I can't help this one — the unification — that's what really hurts me. I wanna say, simply, I missed you so much. I missed you every night and cried almost every day for you. And thank you so much that you survived through the famine and that you see the bright future, right now, on the Korean Peninsula. And that we all can meet the real freedom that you deserve. Monika Evstatieva and Jessica Deahl produced and edited the audio story. Sydnee Monday adapted it for the Web. In South Korea, people are optimistic following last week's historic summit between their leader, President Moon, and North Korea's Kim Jong Un. That's according to polls. But what about the thousands of North Koreans, defectors who live in South Korea? We wondered what they make of these steps toward reconciliation. So today, I spoke with one of them, Hyeonseo Lee. She is 38, a successful author living in Seoul, which she told me is like a different world from the North Korea she fled in secret at age 17. Lee spent a decade in China hiding, living under assumed names before making her way into South Korea. And today, her reaction to this summit in a nutshell - surprise and skepticism. HYEONSEO LEE: I'm not really optimistic about what's going on at this moment because - seems like many people in Korea right now at this moment have some sort of delusion about this meeting. Like, oh, we're going to have a unification and then going to have big changes, and the Kim Jong Un actually not a really ridiculous, bad guy. Actually he's very smart and humorous guy, something - he became a little bit of a star here. So these kind of things are all to me so ridiculous. KELLY: So from what you see, people in South Korea, you believe, are under some sort of delusion that peace may come and that Kim Jong Un means what he says. LEE: Yeah, we shouldn't forget this guy is not a normal guy. It's a guy who killed his own uncle and his half-brother in exile. And he killed so many innocent people in North Korea through the public executions and through the political prison camp. But it's just the one meeting that people are just not praising, but, like, they were so impressed about his everything right now. That's why I'm so annoyed about that. KELLY: When you say you're not optimistic about the prospects for relations going forward, this is because you don't believe Kim Jong Un is genuine when he makes these promises. LEE: Because as a North Korean, every North Korean defector living here believed the North Korean regime will never, never going to do denuclearization. LEE: Yeah. This nuclear - it's not the regime made for attack America or either South Korea. It's made for himself to keep his regime, his power, to protect himself from even domestic political situations. KELLY: The next step that may be - may be - coming is a summit between the leaders of North Korea and the United States, between Kim Jong Un and President Trump. What advice would you give to U.S. negotiators about to come sit down with North Korea? KELLY: Yes, well, we'll see where they meet. That's I guess one of the things they're negotiating is where exactly this might happen. LEE: Yeah, I mean, it's going to help North Korean people more thinking about the Kim Jong Un is a really great man. So in that sense - totally have to avoid. So I was thinking, what about President Trump bring Kim Jong Un to America? I mean, is it impossible? That's what I really want to say. KELLY: So let me ask you this. What gives - is there anything that gives you hope about this moment? LEE: My greatest hope for this is of course the unification between two countries. That is not only my hope - the hope of 25 million North Korean people who are living - I mean, suffering inside the virtual prison in North Korea. And, you know, more than 200,000 defectors are hiding in China currently. So this is everyone's hope right now for us. Just please, my hope is peace in my home country so that we can see a lot family members and friends, everyone there. KELLY: Do you think about what it would feel like if this diplomacy bears fruit and one day you were able to step across that border again? LEE: I do really have hope that I will see the unification and I will step on the border of North Korea and I will look at China in my lifetime. I'm not sure when, but certainly I believe it going to happen in my lifetime. But before that, I mean, my mom, who's living with me at this moment because I helped my family cross the border seven years ago from North Korea - and we all found the freedom right now. But my mom - she's right now 60 somethings, and I really hope it happens in her lifetime because she lost her close seven brothers and sisters, and she's the one who's really crying every night. And it's really hurting for me to see her. And then I can give her everything, but I can't help this one, the unification. That's what really hurts me. KELLY: If you could write a postcard home and speak directly to people in North Korea, what would you want them to know? Would you say? LEE: I want to say simply, I missed you so much. I missed you every night and cried almost every day for you. And thank you so much that you've survived through the famine and that you see the bright future right now on the Korean Peninsula and that we all can meet the real freedom that you deserve. That's what I want to say. KELLY: Hyeonseo Lee, thank you. KELLY: Hyeonseo Lee - she left North Korea as a teenager. She is now an author, the author of "The Girl With Seven Names," and she lives in Seoul, South Korea. Transcript provided by NPR, Copyright NPR.